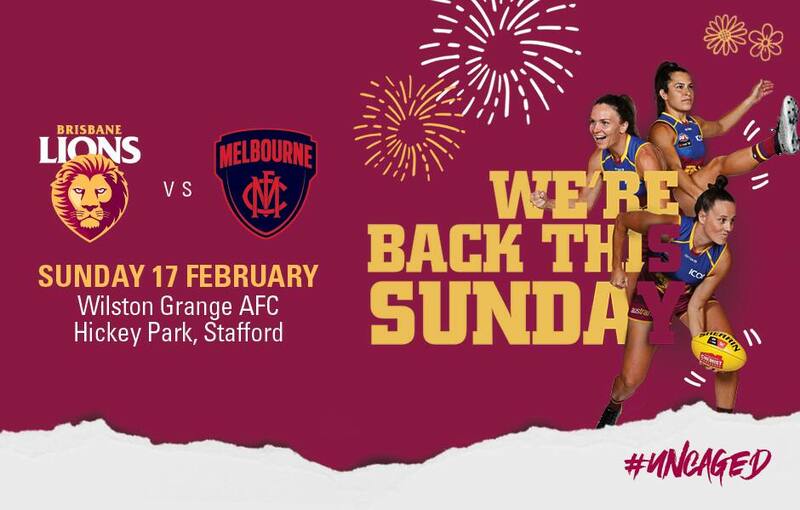 Be there as the Brisbane Lions' Women's team take on the Melbourne Demons in their first-ever game at Brisbane's Hickey Park. Entry is FREE and there'll be plenty of great activities and entertainment including free face-painting, temporary AFLW's tattoos, 2019 team posters and more. Meet the players and grab an autograph before the match at the MemberHQ marquee or Lions Shop pop-up tent. The non-playing Lions will be hanging out there for 2.30pm - 3.05pm or catch them at the half-time break! Thanks to our friends at Chemist Warehouse, there will be plenty of giveaways at half-time. Keep your eyes peeled. Stop by the Hastings Deering's set up to check out their excavators, handball targets, jumping castle and score yourself some giveaways! Stick around after the siren and you could win a sports pack from Hart Sports. Our players will be handing them out after the game. Don't forget kick-to-kick once the players leave the field too! There's loads of food options including food trucks - Coffee Cart, Indimex, Pizza Gal and Fairy's Floss. The Wilston Grange Club cafe, Little Ashton will be open for business too. All Uber and ride share services will be directed towards the drop off zone at Billabong St, Stafford. Please ensure that you direct your driver towards here if you are catching a ride share to the game. Please note that parking for this match is very limited. Patrons are encourage if possible to find alternative methods of transport to get to the ground. If you do wish to park there will be limited parking available at Stafford State School and local businesses located near the ground along Babarra Street. A disability drop off area, as well as limited disability parking will also be available near the entrance of the ground via Babarra Street. Patrons attending the event who require disability parking are encouraged to call AFLQ on 0414 468 820 for more information. Thanks to Hyundai, we’re giving 50 lucky 2019 Brisbane Lions Members the chance to park at Wilston Grange Football Club. For your chance to park in the Hyundai Car Park, click here to enter. Seating is not provided for this event. Patrons are permitted to bring along their own folding chairs to use. No marquees are to be brought into the stadium. No dogs are permitted at the grounds. No marquees or pop-up tents permitted at the grounds. Get behind the girls and join the conversation on our Facebook Event! Keep up to date with all things Lions AFLW by following us on Twitter and Instagram. Tag your social media posts with #Uncaged and #AFLWLionsDees for your chance to pop-up in our Round 3 Social Wrap!